While Bollywood business is in sharp decline, the Pakistani cinema, though small, is growing very rapidly with the explosive growth of multiplex theater screens. Pakistan's "The News Sunday" estimates that box office receipts in the country jumped 28 per cent in 2015 as compared to 2014 and this figure is only expected to grow in coming years. "In Pakistan, there is a big market for Indian movies in their multiplexes. For decades this revenue was lost to Bollywood because the movies were pirated. Under former president Pervez Musharraf, the official screening of movies was allowed, benefiting both nations. Today all Bollywood movies are shown there. Unfortunately, the current state of ties between the two countries has been allowed to deteriorate so much that we should not be surprised if Musharraf's wise decision is reversed." It can be a win-win arrangement with Pakistani artists working with their Indian counterparts in Indian movies and increasing Bollywood revenue from the growing Pakistan market that is already the second largest market for Bollywood entertainment. However, the powerful Hindu Nationalists appear to be succeeding in thwarting this partnership. If the anti-Pakistan rhetoric and the attacks on Pakistani artists in Mumbai continue, it is very likely that Pakistan will respond by reimposing the ban on showing of Indian films in a rapidly expanding market market for Bollywood entertainment. In addition to increasing estrangement between the two neighbors, stopping cooperation and collaboration will be a significant blow for the entertainment industries in both India and Pakistan. All over the world Indians keep saying that bollywood produces more movies than any other country. Yet they fail to realise that their global share of film revenue is negligible. The best movie in recent times Indians say bollywood has produced is PK. But very few people know that its a poorly copied version of an Eddie Murphy movie Holy Man with some Indian masala. So stop this BS about bollywood is important for Pakistani cinema industry. I hope people of this great country move on from Indian idiotic crap that they call movies and develop their own material and in the time being start enjoying the original content bollywood copies from called HOLLYWOOD. NEW DELHI: Snapchat CEO Evan Spiegel said India is too poor a country to expand its business to, a former employee of the company has alleged in a lawsuit. The former employee, Anthony Pompliano, alleges that the comment was made in a 2015 meeting discussing user growth, where Spiegel reportedly said, "This app is only for rich people. I don't want to expand into poor countries like India and Spain." Variety magazine reported the comment earlier this week, when Pompliano's allegations were made public. Pls be informed that Bollywood is not the only industry in India. There are at least 3 other film industry of India, namely Telugu, Tamil and Malayalam which are big. Telugu and Tamil are both $250 million dollar industry, despite being restricted to mainly only one state. In my stay at UAE, I can assure you that Pakistanis are as obsessed about Bollywood as Indians are. For the record I am a south indian and couldn't care less for bollywood. Sir the last year didn't include the biggest hit Dangal, with its domestic business it will touch 400M$. Omar: "Sir the last year didn't include the biggest hit Dangal, with its domestic business it will touch 400M$." #Dangal released Christmas 2016. 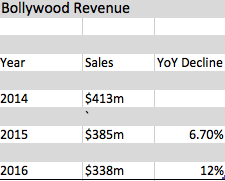 Its first week receipts were $30 m, bringing total #Bollywood revenue to $368m, down from $385m in 2015. The sequel to the 2015 epic has collected $131 million worldwide, beating previous record-holder 2014's 'PK'. Following its record opening weekend when it released worldwide on April 28, Baahubali 2: The Conclusion has become the highest-grossing Indian film of all time. Because India does not officially report box office numbers, local reports have tracked the latest figures. The film reportedly has crossed $131 million (over 8 billion rupees) worldwide, easily beating the estimated $123 million global haul collected by previous record-holder, 2014's PK which starred top actor Aamir Khan. With the film collecting $13.1 million in the U.S., Baahubali 2 also beat previous record-holder Dangal's $12.4 million total haul in the territory. The real-life wrestling drama also starred Aamir Khan. In India, the film has collected over $106 million, becoming the highest-grossing film in the country, beating previous record-holder Dangal which collected $83 million. Baahubali 2 is the sequel to the 2015 epic Baahubali: The Beginning and is directed by acclaimed South Indian helmer S. S. Rajamouli. Planned as a two-part epic, both films were simultaneously filmed at an estimated budget of $40 million, making this the most expensive Indian production ever. The films are produced by Shobu Yarlagadda's Arka Mediaworks. The sequel continues the story of warring royal cousins in an ancient mythical kingdom and again features top South Indian stars Prabhas, Rana Daggubati, Tamannaah and Anushka Shetty. The global success of SS Rajamouli’s fantasy epic sequel Baahubali 2: The Conclusion has once again brought Indian cinema to the attention of the world. Its forerunner, the $31m-budgeted Baahubali: The Beginning (2015), grossed $100m worldwide but caused little more than a ripple outside India. Within the country, it made waves because the film, made in the south Indian Telugu and Tamil languages, saw the Hindi-dubbed version alone gross more than $20m. It is a common misconception that the Hindi-language, Mumbai-based film industry – known as Bollywood – is India’s national cinema. The numbers tell a different story. India produces an astonishing 1,900 films a year on average, of which Hindi-language Bollywood accounts for about 340. The bulk of the rest comes from the Tamil, Telugu, Malayalam, Kannada, Marathi, Bengali, Punjabi and Gujarati languages. Domestic box office has remained stagnant at about $1.5bn and, while Bollywood might produce more films (Tamil had 291, Telugu 275, and Kannada 204 films in 2016), it contributes just a third of the box office gross. In short, Bollywood has the visibility, but not the profits, with the under-performers far outweighing the hits. In this context, the numbers racked up by the “regional” Baahubali 2 – budgeted at $39m, made in Telugu and Tamil, with Hindi and Malayalam dubbed versions – are astonishing by Indian standards. The film opened on 28 April and grossed $194m in 13 days, making it the highest Indian grosser of all time and putting it on track to become the first Indian film to gross $200m. It easily outperformed the $123m collected by PK (2014), starring Bollywood icon Aamir Khan. The film industry in Pakistan is as old as the country itself. It has seen the best of its days, but sadly, the present situation is nowhere near to what it had been. The good old days had given Immortal tunes, excellent films, self made stars and award-winning directors, but mostly depended on individuals. Despite lack of equipment and resources, country’s first film, Teri Yaad, was released in August 1948. Nasir Khan, brother of the famous actor Dilip Kumar, was the hero, with Asha Posley playing his love interest. Pakistan’s first Golden Jubilee film, Sibtain Fazli’s Dupatta, was released in 1952. The film was also appreciated in India at release. It had Noor Jehan as lead, while the music was composed by Feroz Nizami, who had earlier composed for Noor Jehan-Dilip Kumar starrer Jugnu in undivided India five years back. Like Nizami sahab, musicians Ghulam Haider, Rasheed Atre, GA Chishti and Khwaja Khurshid Anwar, opted to Pakistan and played an important role in establishing the industry. Many stalwarts from India, namely Munshi Dil, Shaukat Hussain Rizvi, Fazli brothers, also migrated, and by the end of the 50s, Pakistan had its set of directors. A young Allauddin, who played the role of Nargis’s father in Mela (1948), remained active for over 30 years, performing memorable roles in his career. The struggling days of the industry would have been different, if there had been no Santosh Kumar or Sabiha Khanum. The ‘first couple’ of the industry eventually tied the knot after giving hits like Do Aansoo (1950), Ghulam (1953) Qatil, Inteqaam (1955), and Sarfarosh (1956). Actor Sudhir was labeled an action hero with hits like Baaghi (1956) and Akhri Nishan (1958), while Syed Kemal, a replica of Indian superstar Raj Kapoor, came on the scene with Thandi Sarak (1957). He could dance as well as made you laugh. Phenomenal Rise of Aslam Pervez, first as a hero and later as a villain, was termed legendary in any phase of life. It is credited as the golden period of the industry. With limited ban on Indian films, local productions thronged. Field Marshall Ayub Khan’s rule had restrictions on nearly everything, but it was the creative team of director Khalil Qaiser- music composer Rasheed Attre- writer Riaz Shahid who accepted the challenge and gave out exceptional films like Shaheed (1962), Firangi (1964) and Hukumat (1967) until Qaiser’s death in mysterious circumstances. Moviegoers should rejoice as the government is planning to increase the number of cinema screens from 127 to 1,000. Information Minister Fawad Chaudhry said that more cinema screens will create 20,000 jobs and give a boost to the film industry. Pakistan welcomes any joint venture in the arena of exchange of films and co-productions, he said. Chaudhry met with the US Chargé d Affaires Paul Jones on Tuesday. The two agreed to boost cultural cooperation revival of Pakistani films. The revival of the cinema would not only provide entertainment to the people, but would also generate economic activity, he remarked. He further added that media was enjoying unprecedented freedom in Pakistan, and the current government believes in freedom of expression.